Number of candidates eligible to participate in the Ebonyi State University, EBSU post UTME screening exercise for the 2015/2016 academic session. Update: EBSU Post UTME/DE Form – Details & Guidelines [2015/16]. This is the 2015 UTME Performance index of the Ebonyi State University (EBSU) whose cut-off mark was set at 180 in the last post-UTME for both 1st and 2nd choice candidates. 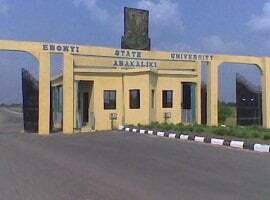 EBSU last cut-off mark was set at 180 (EBSU management also invites candidates that scored 180 and above irrespective of their institution of choice). So if EBSU should go with 180 this year again, below are the statistics of candidates eligible to participate in the university post UTME screening exercise. Conclusively, only 7,277 candidates are qualified to participate in EBSU post UTME screening exercise.